Happy Friday! This week for the Friday Five, we are talking about food and drinks. 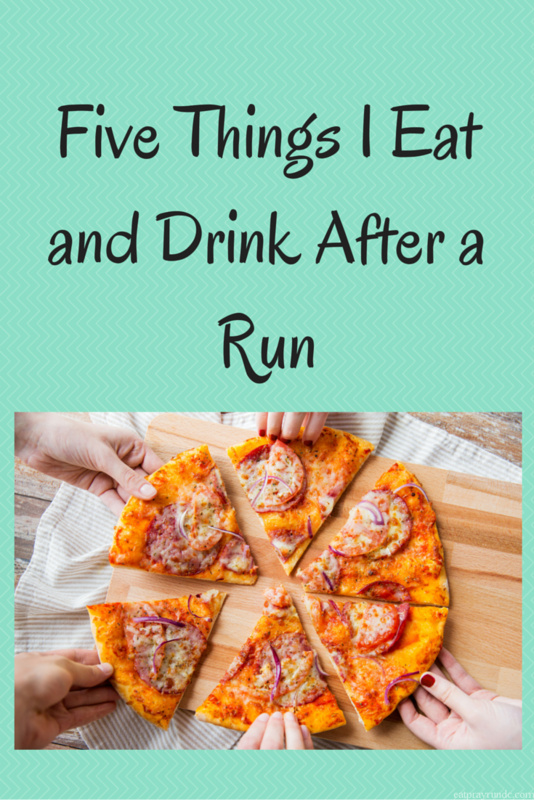 I thought I’d share five things I eat and drink post run. After a hard run, I try to make sure I’m fueling back up properly. Don’t forget to check out Cynthia and Mar and some of the other folks who link up with us – and please don’t forget to link to your hosts if you are participating! I wanted to give you all a heads up that next week, I’ll be hosting a really fun giveaway that you’ll appreciate if you are a runner so don’t miss that. Have a great weekend! Egg hash. Basically I fry up an egg, chicken sausage and whatever veggies I have handy. If I’m feeling fancy I add pesto. So delicious and lots of protein to help recovery. Chocolate milk. A tall glass of chocolate milk is so refreshing after a hard run. Also helps with recovery. I love that more and more races are serving chocolate milk at the finish line. So awesome. Pizza. Because it’s delicious and I like delicious food. Need I say more? Sandwich with a side of sweet potatoes. My go to sammie is good bread, mozzarella cheese, tomatoes and spinach or kale. So dang yummy. And if I happen to have a side of sweet potatoes, even better. Bacon. Because it’s always the right answer. Sometimes the bacon is on the pizza, sometimes it’s on the sandwich, sometimes it’s just on the side. It’s always right and it always makes me so happy. I love food and I appreciate how important it is to refuel after a run. I think that this intense training has really driven that home for me! Best of luck to everyone running Rock n Roll DC this weekend! I’ll be cheering near mile 12 if you are running! What do you eat post run? Chocolate milk is my favorite post-run treat. Bill, our friend Beth, and I used to drive to 7-Eleven after our long runs to buy super cold chocolate milk. That first sip was heavenly! YES to eggs ! I usually have them with pepperoni and sweet potato. My favorite post run meal. Ever. Love pizza! But I usually have a recovery shake just after my run. My sweet husband always has scrambled eggs waiting for me to devour after my Saturday long runs! I tend to eat a lot of eggs with veggies too and I’ve been making a sweet potato/broccoli oven roasted combo that I have been eating with EVERYTHING!! And pizza – who doesn’t love it? Have fun at the race this weekend! Bring on that cowbell!! Allie recently posted…Fast Friday Workout! Yes to all of this! Especially the bacon-bonus if it’s in the egg hash 🙂 Have fun this weekend! If I finish a run or race at home, I normally eat egg hash/scrambled eggs as well. It’s easy, quick and healthy. If I go out to eat, it’s normally around breakfast or lunch time so that is a toss up. When it’s cold, I crave more soup or hot cocoa. When its hot out, I crave crispy foods like vegetables. Post run, it’s usually eggs and toast. Post bike-ride it’s leftover pizza if we have any! I’m struggling with this now that I’m not eating dairy. I used to be a fan of a huge glass of chocolate milk. Post long run chocolate milk is the best and pizza has always been my favorite treat too. Thanks for the link up! MMMMMmmmm – egg hash and bacon! Yes, please. I usually have omelets if I go out or chicken or eggs and some veggies if I am home. Pizza is my pre-race fuel! Hash browns, egg hash, egg bowls, pretty much all things breakfast I’ll say yes to. I even did the race retreat at Disney one year for the hot breakfast, but realized I need at least 30 minutes for my stomach to settle after a long race. Mmm bacon! I love having pizza for dinner on long run day. Usually right after a run I have a sandwich or cereal- depends if I’m feeling breakfast-y or lunch-y. 🙂 Happy Friday! Bacon. Always the bacon!!!! Yes! I also love pizza! I usually try to have a protein smoothie right after I run, if it’s right after a race…I want Golden Corral or pancakes at Village Inn! So… I eat salad after a long run. Am I weird? Hahaha. I don’t know why but it always sounds so good and refreshing!! Egg and cheese sandwiches are my go to after morning long runs! Though that hash sounds like a great idea to try too. I’ve been getting in a habit of cooking eggs as well. What kind of chicken sausage do you use – they always look good. I’ve seen so many varieties (I tried the Brats one from WF this past week). Yes to pizza! One of my favorite local races serves pizza post race. Its the best post race treat at 9:00 in the morning! I love smoothies with banana, frozen fruit, almond milk, spinach, and peanut butter after runs. I usually finish long weekend runs right around lunch, which is always nice! I love pizza after a long run. But my appetite isn’t always there right away, so I usually start with coffee & some naan dipped into hummus while I figure out what I’m hungry for & get cleaned up. So true that bacon is always the right answer 🙂 I’ve never tried pesto with eggs but I bet it’s a delicious combo – great idea! eggs w/ avocado or bananas are my go-tos! That’s the best reason ever….because it’s delicious!! And YES, pizza is so that! I always always order the meat lovers pizza. I can’t get enough meaty, salty pizza. If I am not having pizza post-race, I like anything meaty like maybe a pulled pork sandwich. YUM! I love a good cold icy beer after a run but pizza? The bomb! Ever since I was diagnosed with a wheat allergy, I have been craving it! I also love a good sausage egg scramble! Thanks for hosting! YES to pizza, especially pizza with bacon on it! Sometimes I try and be healthy and eat turkey bacon, but really, we all know regular bacon is better! After a long run I will eat anything and everything I see , I turn into a pig. Sometimes I wonder whyI don’t gain a lot of weight. I love bananas and almond butter on toast with chocolate milk when it’s warm or hot cocoa during winter. Delicious! I usually eat a banana and some trail mix. I am game for pizza and will keep that in mind! I love pizza and chocolate milk too. I hope to see you while I’m on the course tomorrow and that I’ll have a smile on my face this time :). That all does sound pretty yummy!